Being popular doesn't mean being profitable. Just because something is popular, that doesn't mean it's profitable. Just ask Pandora Media how it's faring with its incredible popular music-discovery service and ocean of red ink. And so it goes with software giant Microsoft (Nasdaq: MSFT), as most would consider the Xbox one of its biggest consumer hardware successes. The original Xbox launched in North America more than a decade ago, way back in November 2001. With that generation of gaming consoles, Sony (NYSE: SNE) beat Mr. Softy to the punch with its PlayStation 2 that was released in October 2000, while Nintendo's (NASADQOTH: NTDOY.PK) GameCube followed literally three days after the Xbox. When it was time for the next generation of consoles, the Xbox 360 jumped the gun on everyone, launching four years later in November 2005. It would be a full year later until both Sony and Nintendo would launch the PlayStation 3 and Wii, respectively, in November 2006, two days apart from each other. Since then, the Xbox 360 has become the top-selling game console as Microsoft continues to teach it new tricks. The popular and innovative Kinect accessory took gesture recognition to the next level by ditching the need for a handheld controller and empowering players with natural motion controls. The console can now also do voice recognition and is spearheading Microsoft's big push into the living room with TV content, and it will also soon be able to communicate with your mobile gadgets. NPD Group just released its June estimates for the domestic console market, and the researcher estimates that Microsoft sold 257,000 Xbox 360 units during the month, beating the PS3 and Wii for the 18th consecutive month, representing a dominating 47% market share. That's the 16th consecutive month that the Xbox 360's market share topped 40%. The overall market is declining, but Microsoft isn't going down without a fight. The company officially sold 1.4 million units in the first quarter, bringing its cumulative lifetime total to 67.2 million since launch. Attach rates for both software and accessories continue to rise along with evidence that players are maintaining a healthy level of engagement. Players buy an average of 9.2 software titles per console, the highest it's ever been, and Microsoft now has more than 40 million Xbox Live members, which has also never been better. By most measures, you'd think the Xbox business has been a raging success. Too bad you'd be wrong. For starters, the device itself was sold at a loss for many of the early years, a relatively standard practice in the industry. Per-unit losses on the original Xbox were estimated at $125, and about the same amount for the Xbox 360 at launch. Naturally, component costs have come down dramatically since then, but let's take a deeper look. 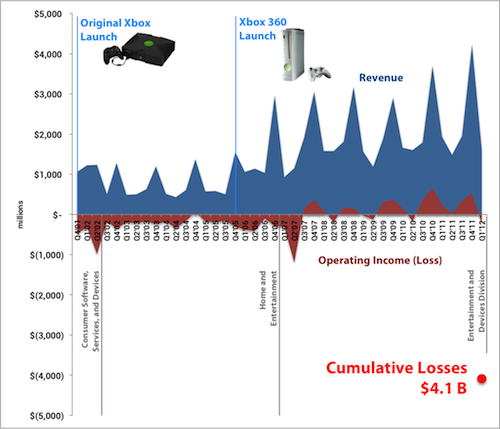 I went back and compiled more than 10 years of data, going back to the quarter that the first Xbox launched, to see how the console has fared in its operating segments over the years. Microsoft has changed the operating segments it reports twice over the years, so keep that in mind with the following graphic. The Xbox has been housed in the consumer-devices segment, then home and entertainment, and currently the entertainment and devices division. Of course, there have been other products in each of those segments over the years, such as Windows Mobile and Windows Phone, but the Xbox is a big contributor. The segment transitions are notated, along with both generations of consoles. The majority of the time is spent in operating red ink, and the cumulative losses of all of those divisions over the years is a whopping $4.1 billion. The good news is that the entertainment division has been consistently generating positive operating income over the past five years or so, with only a few quarters here and there in the red. Although keep in mind we're approaching the next generation of consoles, which requires a lot of dollars for development, and the new units might similarly end up being sold at a loss until costs come down. Microsoft's Xbox "720" is rumored to pack Advanced Micro Devices (NYSE: AMD) graphics, while Sony might even switch from NVIDIA (Nasdaq: NVDA) to also use AMD in the PS4. Graphics are pretty important for gaming consoles, but the unit volumes generally aren't anything to write home about compared with the other core markets for both graphics specialists. At the rate Microsoft is going, there's still hope to dig itself out of this hole, unless the Xbox 720 knocks it right back down. Too bad you can't say the same thing about the online services division. That segment has lost $10 billion over the past five years. That's more than twice the losses in less than half the time! Even though Microsoft is a Dow Jones dividend stock, it's not one of three that dividend investors need. These companies boast sustainable businesses with steady cash flows, and they have a good habit of giving it back to shareholders. This special free report will get you up to speed.